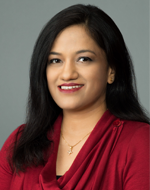 Dr. Roopashree Prabhushankar completed her residency in Internal Medicine at Rosalind Franklin University of Medicine and Science in 2012. She completed training in Endocrinology, Diabetes and Metabolism in University of Missouri, Columbia in 2015. Her interests include mainly Diabetes, Thyroid, Adrenal, Pituitary, Calcium and Parathyroid, Obesity, Osteoporosis and Lipid problems.